you love to stay on your Mac and use mental ray for Maya? Several things are different. For example, the unique use of Mac specific keyboard shortcuts is puzzling, like in the “open scene” window. Switching to the “OS native” file dialog is possible in the Maya preferences. Although it might even be more confusing to use Qt and non-Qt side by side. What about mental ray ? Well, it is only dependent on the underlying Unix basis “Darwin” with its stable and standardized interfaces. That keeps it quite independent from frequent Mac OS X updates, which typically just touch the application levels of the operating system. Normally. But the most recent “Mavericks” update of OS X, version 10.9, seem to have changed some multi-threading behavior of the kernel. mental ray is obviously also affected, and shows unexpected interruptions, or even gets blocked completely during rendering. Our developers are currently diving into it, to come up with a solution as soon as possible. 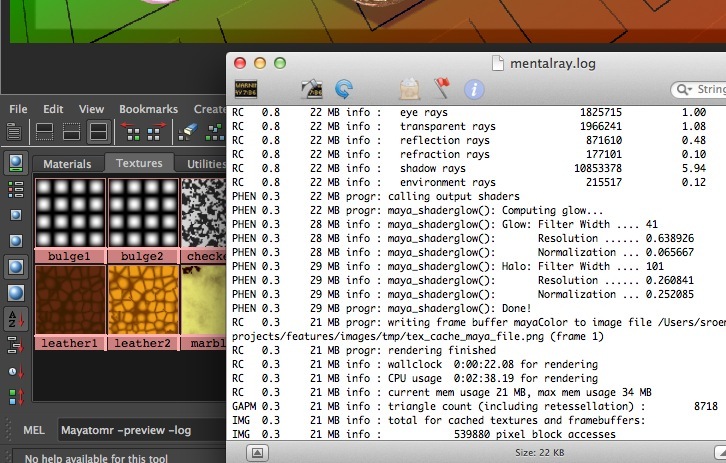 It will create a file with the fixed name “mentalray.log”, typically residing in the last opened scene file directory. Double-clicking on the file in the Mac Finder will open the Console App, giving a similar experience to the message display on other platforms. If you enable the Console preference “bring log window to front” it will pop up automatically with each mental ray rendering of that scene using the -log command.